Morocco, a country in North Africa, is extremely famous amongst tourists looking for leisure as well as people fond of history due to the country’s rich historical, cultural and ethnic background. The country also offers great high-end luxurious activities for the tourists who visit the place all year long with their families and friends. Horse riding, camel riding, MTB, Canyoning, rock climbing, skiing, sandboarding, kite surfing and trekking are some of the popular activities amongst the tourists while they are in Morocco. Trekking in Morocco has its own distinctive experience superior than any other activity. Trekking involves physical challenge as well as an opportunity for the nature enthusiasts to witness the utmost bounties of the mother nature. Here, we will be discussing some of the best places to trek in Morocco. Jebel Toubkal is the highest peak of North Africa that rises up to more than 4100 meters. The peak gives an astonishing and one of a kind bird’s eye view from the top, but very few have what it takes to be at the top and witness what can sooth your eyes and give you a sense of achievement and a reward instantly in the form of the beauty you are able to see from there. Kasbah du Toubkal is a base that lies at the start of the trekking journey for the people. Toubkal Circuit is a famous trek that takes around a week to complete and many people participate in it. Lying in the south of Morocco, it is another not so difficult to trek mountain range. Although it features some very tall peaks- Sirwa there is around 3300 meters tall. Mount Sirwa can be reached in two days from Atougha or people can even take longer trips, say of one week, so that they witness more valleys and other natural elements on their way. Winter is the best time to trek here as the snow-covered mountains offer a breathtaking view and the cold weather reduces the effort required to trek up the mountains. Here, the peaks are not very high- the highest peak Amaloun’Mansour is around 2700 meters tall. An added advantage of going here are the cave paintings. It is a small village near Marrakech and gives a great contrast of a village life with the glamour of a developed city. The area is a heaven of nature. It has numerous kinds of plants which makes the area very green. The highlight of the region are the seven waterfalls of the Ourika river. If you visit Morocco and are a nature lover, this place is a must visit for you. 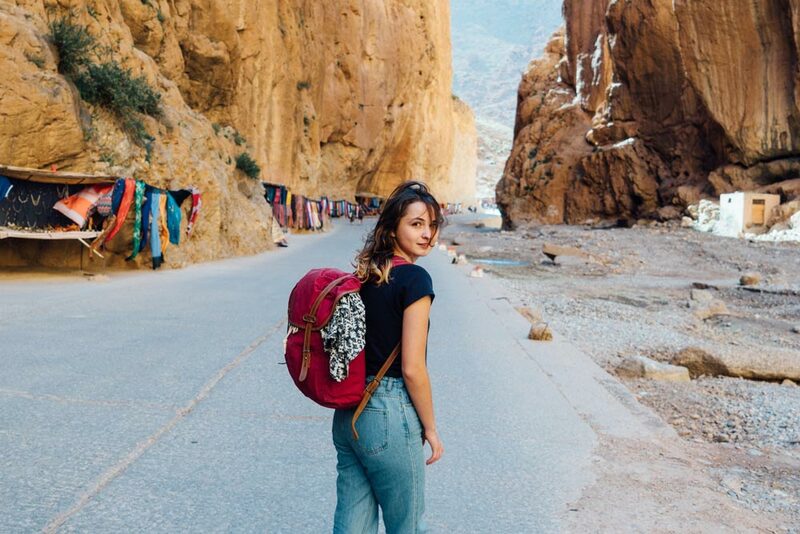 One of the high atlas valleys in Morocco, AitBougmez Valley is extremely picturesque and a wonderful sight to witness for the trekkers while they are challenging their physical fitness too. The place is filled with fruit orchards and lush green fields running for great distances. This area is one of the most diversified with respect to culture in the whole Morocco; and there are said to be more than 25 different communities staying together. The trek is not very difficult too and the area is one of the best for the beginners. The Rif Mountains has the most rainfall in Morocco- more than any other region of the country. It is extremely beautiful, diverse and has a rich historic background too. Chefchaouen is usually the starting point for the trek on the Rif Mountains. Several trails can lead the trekkers to Talassemtane national park which is a heavenly green body of diversified trees. The place is also inhibited by several animals including the golden eagles and gazelles. Less a gorge, more a canyon, Todra offers an amazing place for the trek lovers. It has amazing geographical features including ravines and peaks which not only give an amazing view to the trekkers but also is very challenging for the trekkers mentally and physically at the same time. The sandstone cliffs rise to a height of as much as 160 meters. Surrounding the mount Toubkal, the foothills are not only extremely beautiful but also very suitable for trekkers especially the beginners are they are light and easy to trek. Breathtaking views and beautiful sunsets are inevitable to make you fall in love with the place. Trekking is a wonderful sport as well as a leisure activity which not only gives you a sense of achievement but also makes you mentally and physically fit. Morocco is an amazing place to trek and if you have not tried trekking yet, make sure you do so on your next trip to Morocco.